high standards and inspired service. So, consistent with its rich traditions, and reflecting the school’s commitment to caring and community, the students and faculty of the High School’s Academy of Human Services raised $3,300 to pack over 13,000 nutritious meals for local hungry and food insecure children and families in Joliet. These gifts of love were distributed bu students and faculity to Mt. Zion Baptist Church, The Salvation Army, Morning Star Mission, The Spanish Community Center and The Guardian Angel Home. With an enthusiasm usually displayed at homecoming or a prom - and swaying to the rhythm of Lady Gaga hits -140 student volunteers disinfected their hands, put on aprons, hairnets, and gloves, and joined hearts and hands in producing these nutritious, flavorful meals of pasta and cheese - fortified with vitamins, nutrients, and protein - specifically designed to nurture bodies and lift spirits. While food safety and quality were emphasized during the hands-on training, the experience is designed to be spirited, enriching, fun, and is for many, transformative. 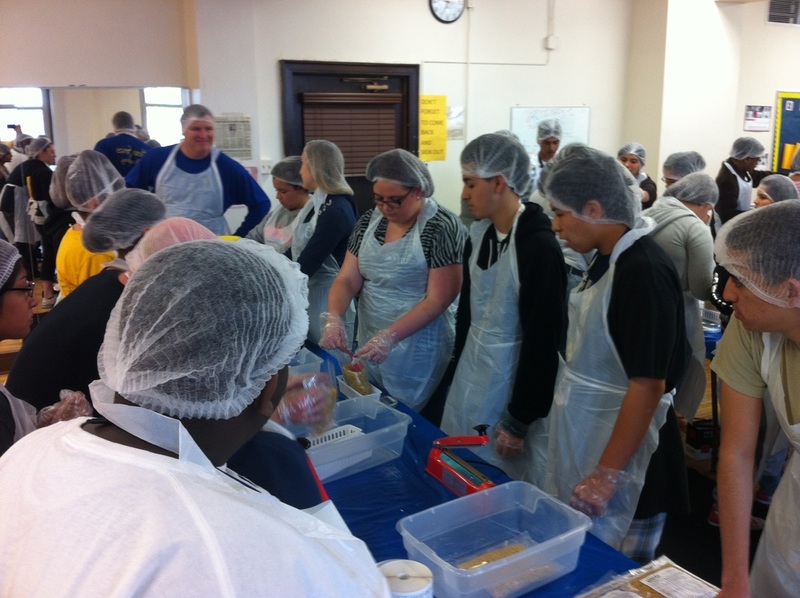 Students formed into production lines,assembling meals from bins of pasta and soy, adding cheese packages, and carefully weighing, heat-sealing and then packing into boxes. And when the boxing was complete, joining in a throaty cheer to celebrate their gift of life to those in need.